Bornholm is meant for photographers and photo bloggers. It comes with two page templates — one for an overview of all galleries and one for a teaser of the last galleries from the different categories. Also, there are two widgets and a few possibilities for customization in the customizer. Bornholm is (of course) responsive, so it adapts well to different viewport widths. Like said earlier Bornholm comes with two page templates. 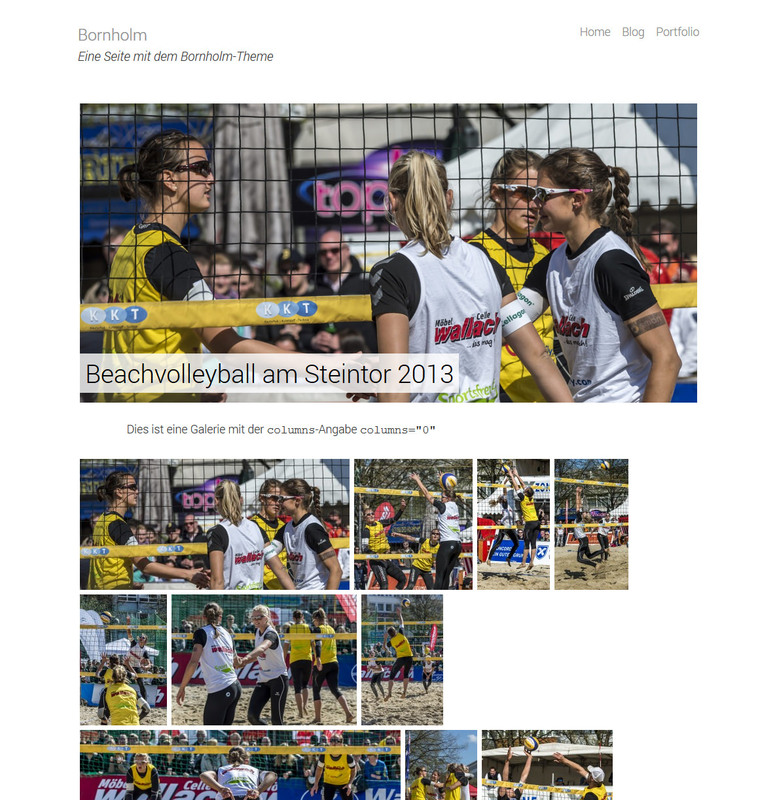 One template displays all galleries of the site. That is how the portfolio template looks like. The other template is meant as an alternative home page. With this, you can display the last galleries grouped by categories. After the last X galleries from a category a link to the category page is displayed (see screenshot above). Both templates are displayed full width without a sidebar. The theme comes with two widgets: One widget to show the last X galleries and one for displaying featured galleries. The widget for featured galleries needs a comma separated list of post IDs. Besides the normal sidebar, displayed on the blog page and all single pages (except single views of galleries), there are three more widget areas. The footer contains two areas — the upper one displays the widgets on wider viewports with a width of 50 percent, the lower one with a width of one-third. 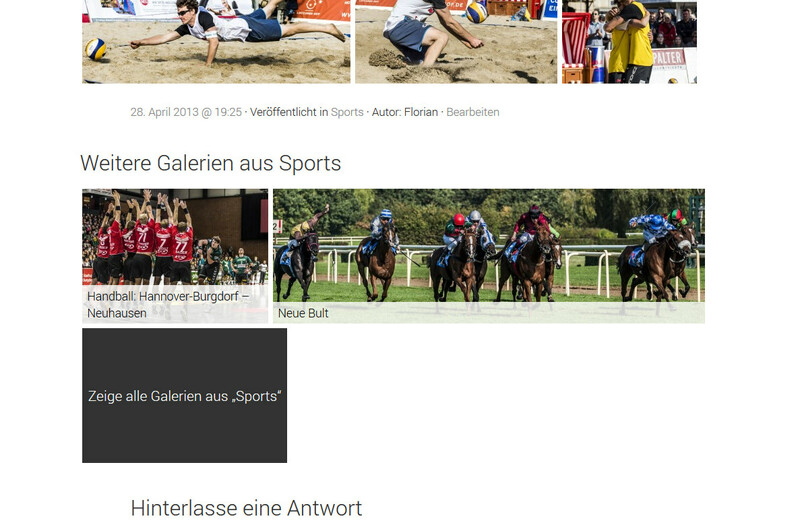 The third additional area shows up below the single view of a gallery. The posts with the post format »gallery« are displayed in a different way than normal posts. The posts are wider in the blog view, and besides a large featured image, there are displayed the first X pictures from the gallery as small thumbnails. The large image is either the first gallery image or the post thumbnail. A gallery post in the blog view. 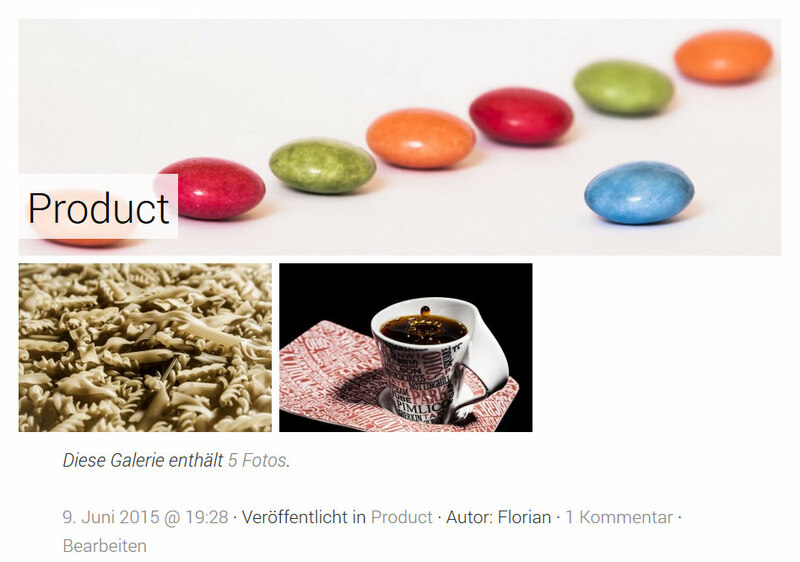 In the single view, the galleries are displayed in full width without the sidebar. Single view of a gallery. 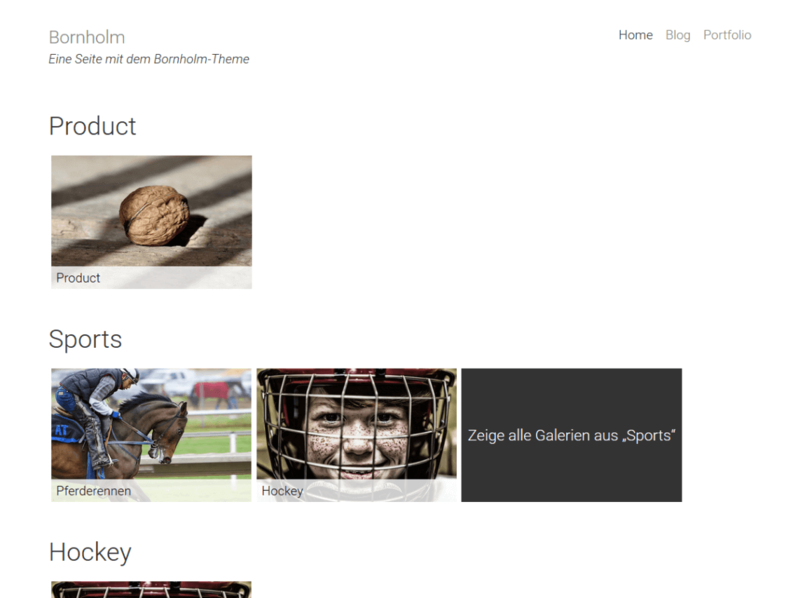 After the post footer of a gallery, the theme displays more galleries from the same category if available. Links to more galleries below the single view of a gallery. The images should be 1592 pixel or wider. That is the width of the large image in the single gallery view. You can adjust some settings for Bornholm in the customizer. You can customize how many galleries from each category to display on the alternative home page and select to hide the post title. Besides, you can display the gallery categories hierarchically. Sub categories are always displayed under the top category. 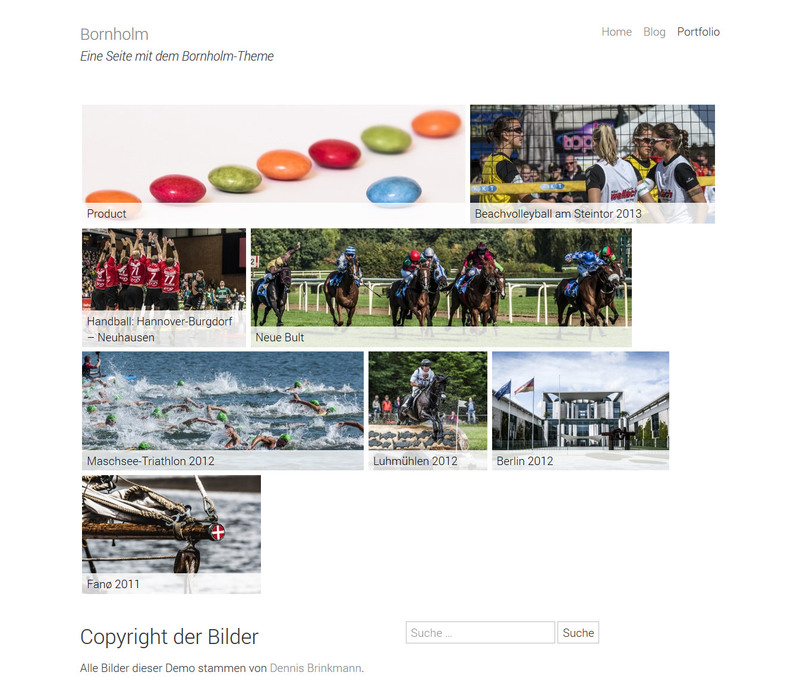 For the portfolio template, you can also optionally hide the titles of the galleries. Besides the simple listing of all galleries you can group them by categories like on the alternative homepage. Furthermore, you can adjust how many galleries from the same category are displayed below a single gallery view and if the title should be hidden. The number of thumbnails below the large featured image of a gallery in the blog view can be adjusted in the »Content« panel. There you can also adjust the visibility of gallery titles for both widgets. For better page speed you should use a lazy loading plugin like Crazy Lazy. Bornholm is ready for translation. Currently, it is translated into German and English. If you want to translate it into another language, check out the theme on translate.wordpress.org.